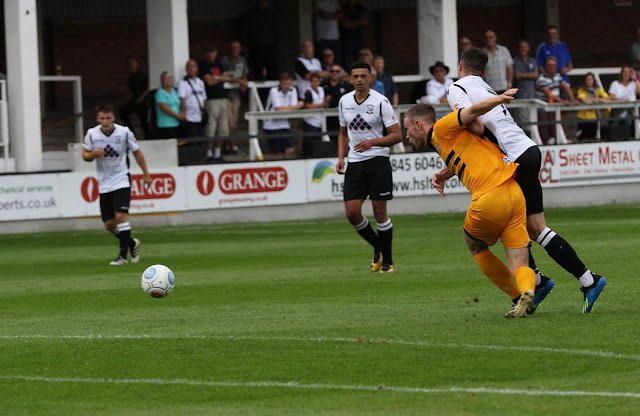 Hereford were beaten 2-0 by League Two Newport County on Saturday afternoon, with the scoreline probably a little unfair on Hereford. 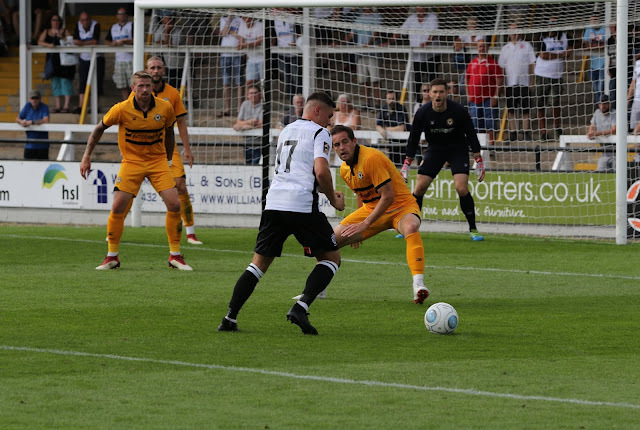 There were no new faces among the Hereford side, and no sign of trialist Tom Fry, but Mike McGrath was handed his first start of preseason as he comes back from injury. It was set to be an interesting afternoon for the press at Edgar Street as they had to content with a Newport side who weren't playing in numbered shirts. Getting the game underway, the visitors tried to work the ball into the box straight away as they attacked the sparsely-populated Meadow End in the first half, but Danny Greenslade showed his intentions early on as he flew through the Exiles' winger to prevent a cross. 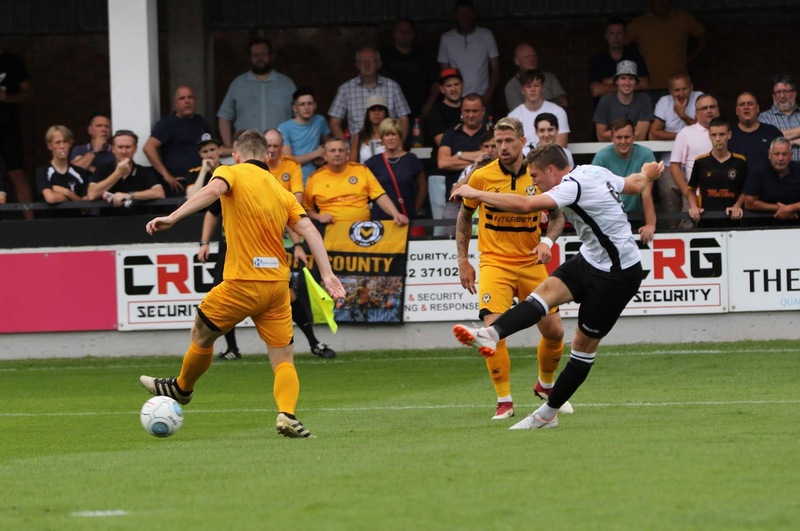 There was an early chance for Hereford to take the lead as with nine minutes on the clock new signing Harry White put keeper Joe Day under some early pressure. 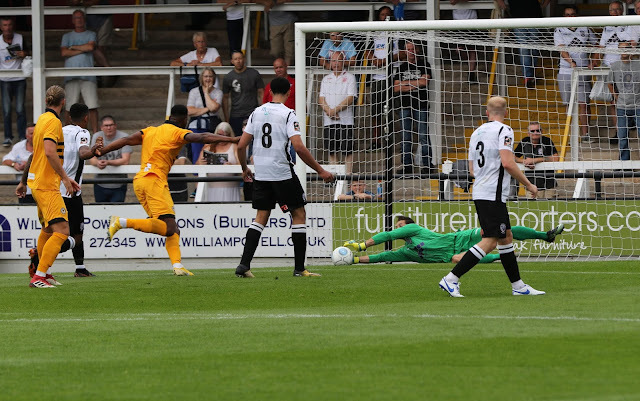 After a quick one-two with former County player Jennison Myrie-Williams, White's shot across the face of goal from the right was just wide of the far post. Back in front of the home terracing, Callum Sainty gave away a free kick after his foul on Charlie Cooper. 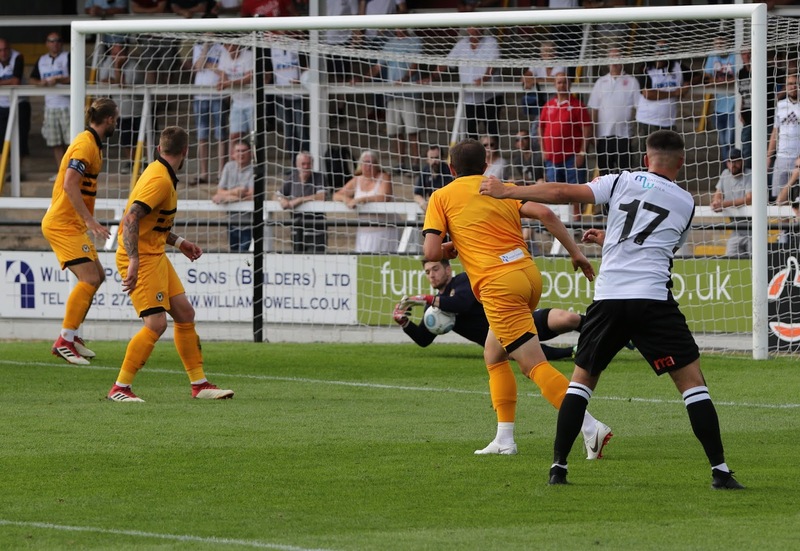 As Dan Butler's set-piece looked certain to break the deadlock, Hereford stopper Martin Horsell did well to prevent Newport taking the lead by diving low-down to his right. 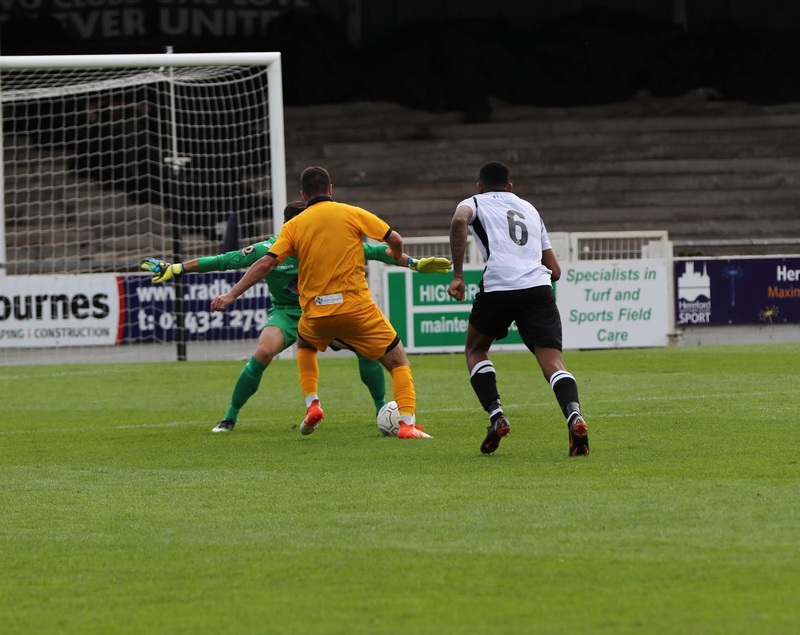 Chances kept coming for both sides, with another cheap free kick given away just outside the box by Hereford. As Josh Sheehan stepped up, Horsell was left with the easy job of watching the ball sail well over the crossbar. Eliot Richards then tried his luck from 18-yards but it was blocked by a sliding defender and Newport were quick to break. Dan Butler and Jamille Matt combined effectively down the left-wing, and then with Jordan Liburd caught in no mans land, the ball was played through to Antoine Semenyo who fired wide. With 30 minutes on the clock, a central free kick to the Whites was drilled just wide by Mike McGrath. After a brief debate over who was going to take it, McGrath's vicious shot was inches wide of the upright. 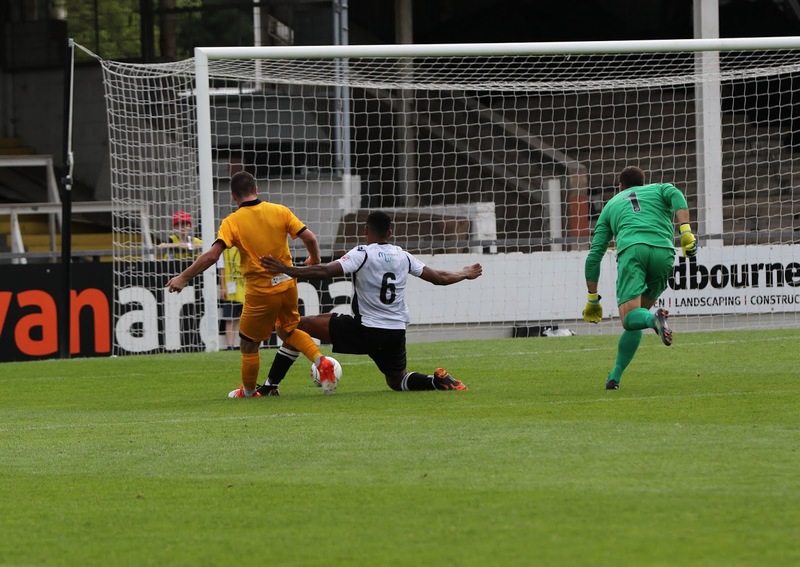 Six minutes later Horsell managed to prevent Antoine Semenyo his first goal in a County shirt after only signing for the club on Wednesday. Tyler Forbes did well to tee-up the 18-year old, but Horsell palmed away the shot and the ball was scrambled to safety. It didn't take long for the Bristol City loanee to get his name on the score sheet though, scoring from the spot three minutes before the break. The referee didn't hesitate in pointing to the spot after right-back Keiran Thomas was adjudged to have fouled his man on the edge of the 18-yard box, with the player questioning the decision when he spoke to Bulls News after the game. Semenyo confidently stepped up and sent Horsell the wrong way, firing hard into the left-hand side of the goal to give his side a one-goal advantage going into the break. With just the one change made at the break, Robbie Willmott made an instant impact on the game as he had the first real chance of the half. 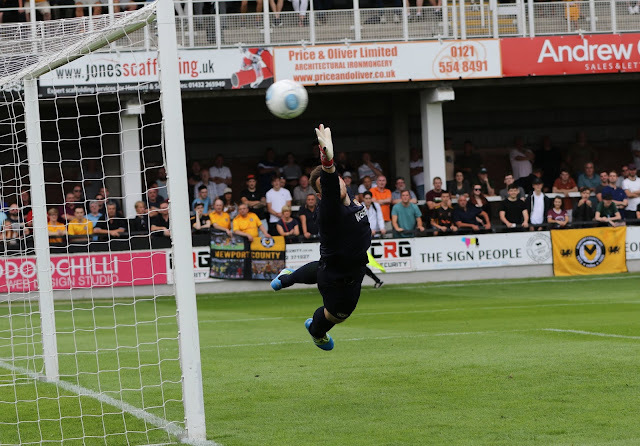 After being played in by Andrew Crofts, Willmott was unable to get enough on the ball to test the keeper as his shot drifted wide. There had been a number of rash challenges in the first half and this looked set to continue into the second. With Hereford being awarded a free kick on the right-wing following a foul on Jennison Myrie-Williams, Eliot Richards stepped up. The former Merthyr midfielder delivered a sweet ball into the box, with keeper Joe Day only able to punch it away as far as Harry White. White tried his luck, but after firing into a crowd of players, the ball harmless went behind for a corner. With changes aplenty for both teams, one of Hereford's substitutes Mike Symons only managed to stay on the pitch for seven minutes as he picked up a knock. Mike Symons was on the receiving end of a neat ball from strike-partner Lance Smith, but he couldn't control his shot and it as too high t trouble the keeper. But in the process, Symons managed to pick up a knock to his ankle so was replaced by Adam Hockey. 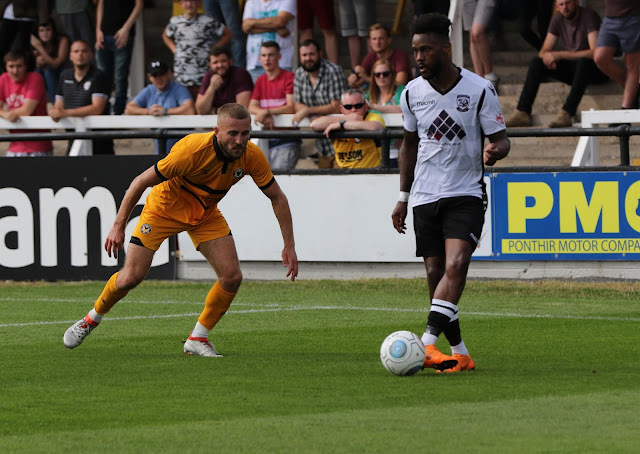 A great chance for Jamie Bird followed as he continued his impressive preseason, with help from Jennison Myrie-Williams in the build-up. Bird's shot stung the hands of the keeper from close-range in what was one of the best chances of the game. 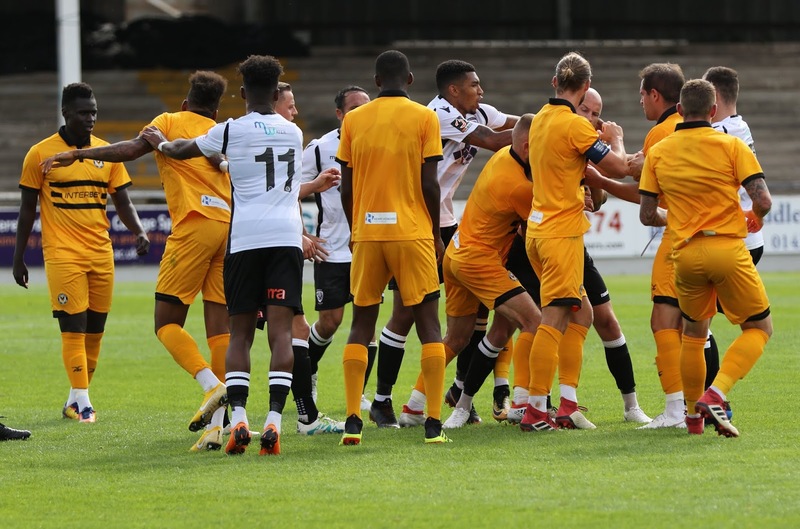 challenge involving Hereford's Adam Hockey and Newport's Marsh-Brown led to some handbags between the two sets of players, but the situation defused relatively quickly with no cards to be seen. 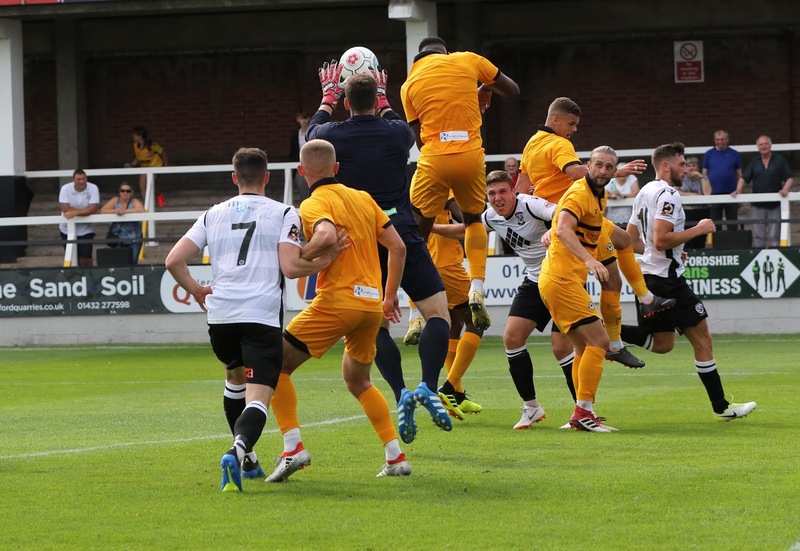 With Hereford pushing forward in the dying stages of the game, they were caught out in the first minute of stoppage time as Newport killed the game off with their second. Padraig Among didn't give up as he chased down a long-ball forward from Matty Dolan and after rounding the keeper had the easy task of slotting home into the back of an empty net. Hereford: Horsell, Thomas (Franklin 79'), Greenslade (Hall 63’), Richards, Green (c), Liburd, Smith, Sainty (Murphy 56'), White (Symons 63' (Hockey 68')), McGrath (Bird 56'), Myrie-Williams. Newport County AFC: Day, Forbes (Pipe 62’), Franks, O’Brien (Willmott 45’), Bennett, Butler, Crofts (Marsh-Brown 62’), Cooper (Trialist 1 51’), Sheehan (Dolan 62’), Semenyo (Amond 62’), Matt (Touray 79’).